The Quinte District is located along the northern shore of Lake Ontario on The Bay of Quinte in Eastern Ontario, and includes Belleville, The City of Quinte West (which encloses Trenton), The Municipality of Prince Edward (which encloses Picton), Napanee and communities north of that line. 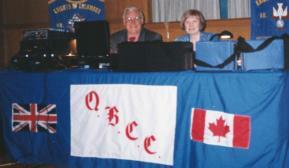 The Quinte Ballroom Dance Club has evolved from an earlier organization named the Quinte British Canadian Club. Ballroom dancing remains a very popular social activity in the United Kingdom and many Commonwealth countries. The QBDC is a continuation of this tradition. At the conclusion of World War II, military sevicemen, some with families, and others looking for a better life, adopted Canada as their new home. Canada was a place of opportunity. At the same time, Canadian servicemen and women returned home with new wives and husbands found during their overseas postings. This brought significant numbers of new people to Canada, from The British Isles and other countries, to settle in the Quinte District, and to become new Canadian citizens. These new Canadians forged new friendships and developed family ties with other Canadians, often gathering informally in each others homes to keep in touch. From this group, in 1977 The Quinte British Canadian Club (QBCC) was established, as a non profit organization, to enhance the social and cultural life of its members and to develop a spirit of co-operation, tolerance, equality and understanding with all people, irrespective of race, creed or color. The first President was Dorothy Kirby (from Beverly in Yorkshire) and charter members included Ron & Florence Thompson (from Brimley, England). Early QBCC meetings were held at Parkdale Community Center and major club activities included operating a pavilion in the annual Ethnic Festival. (The Ethnic Festival is now included in Belleville's annual Waterfront Festival). The QBCC established a constitution, and an executive committee, with officers elected annually including a President, Vice-President, Secretary, Treasurer, and other positions which include those in charge of the Bar, Prizes, a Social Convener and Music (DJ). The QBCC membership grew and soon developed a multi-cultural membership that included Canadians with a British background and Canadians of various national backgrounds. Club membership is open to those who embrace the aims and purposes of the group and may include singles or couples. The current membership includes Canadians from all walks of life who can look back to British, Scotch, Irish, Dutch, Polish, Ukranian and American ancestry. The QBCC activities included - but were not limited to - a monthly social gathering, club membership promotions through various media, dance demonstrations, support of local or national charities, participation in community festivals and bus trips visiting other like organizations. Over the years, the monthly social gatherings focused more and more upon dance activities centered around modern and classical sequence ballroom dancing. In recent years, international style ballroom dancers have joined and added to the style of dancing. Now that ballroom style dances dominate our social activities, the membership agreed to change the name of the club from the Quinte British Canadian Club to the Quinte Ballroom Dance Club. Otherwise, the original club constitution remains the same. The QBDC monthly social gatherings feature fellowship, and dancing. The present membership has a significant interest in Ballroom Dancing, embracing music of the Big Band era (and all those nostalgic memories of the late 30's 40's and 50's), strict tempo style ballroom dancing music and the familiar associated Standard, Latin, Old Time and contemporary dances. Sometimes a familiar line dance appears in the program. Music for dancing is selected from a collection of over 3000 dance selections, played at sensible volume levels. Every effort is made to fulfil specific music requests. Socials continue on the third Friday of each month at the Masonic Temple, in Belleville at 8:00 pm, September to May. There is always a friendly fun informal atmosphere. Socials frequently have themes such as "Home Coming", "Mardi Gras" or "St Patrick's Day". Dress is always optional, and ranges from blue jeans and patches at the "Hard Times Dance" to something more formal at the annual Christmas party. All socials are non smoking and throughout the evening refreshments are available from the bar which is operated by the Masons. A buffet lunch is served at about 10:15 pm. Membership fees which support the Club activities are paid annually, and entitle members to reduced admission to the monthly socials. Prospective members and Non members are welcome at QBCC Socials. Halls that are suitable for ballroom dancing are becoming scarce, and often in competition with weddings and other large party groups. These facilities are often pre-booked a year or more in advance. The club executive kept on its toes working to provide good dance venues at affordable prices.